Every engineering student needs to develop academic projects to improve their technical skills and fulfil their criteria to become a successful engineer. 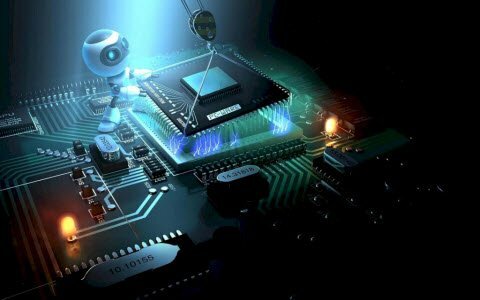 Thus, we are providing a few interesting free electronics circuits for engineering projects in different domains such as power electronics based projects, robotics based projects, and so on. 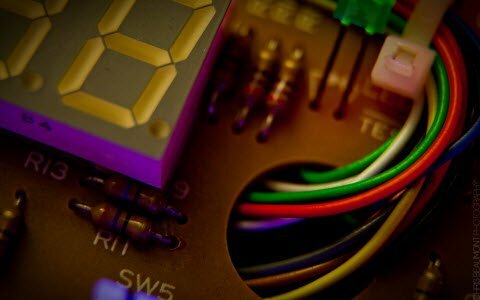 In this article, we are providing a few free electronics circuits to design simple projects on your own. 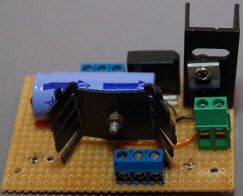 The circuit of Dark and light Indicator is kind of simple circuit projects. At the time of darkness, the output of LDR1 goes to high. And these high inputs are applied to IC1 NE555 at pin2 that the shifts resistance of pin 2 of IC1 at high state. Because of this the resistance of pin 3 of NE555 switches to high. As results of it, LED connected to pin 3 of IC1 glow. At constant time resistance of LDR2 is also a high state. Because of this reason transistor T1 whose base is connected with LDR2 remains in the ideal. 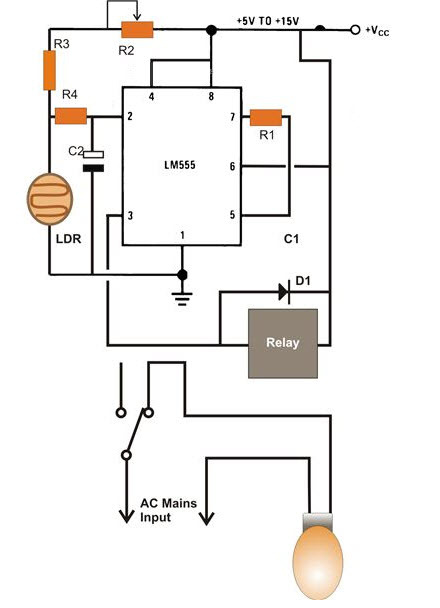 As a result of it IC2 UM66 that is connected to the collector of transistor T1 remains in the off state and no sound is detected from the speaker, however, at the time once the area is jam-packed with light resistance of LDR1 move to low condition. Pin 2 of IC1 NE555 shifts into high state. Because of these high resistance outputs from pin 3 of IC1 NE555 moves to low state. These low resistances, LED joined to pin 3 of IC1 LED wouldn’t blink. Within the same condition once the area is jam-packed with light LDR2 resistance is additionally low. The electronic circuit diagram works on 6V of power supply. 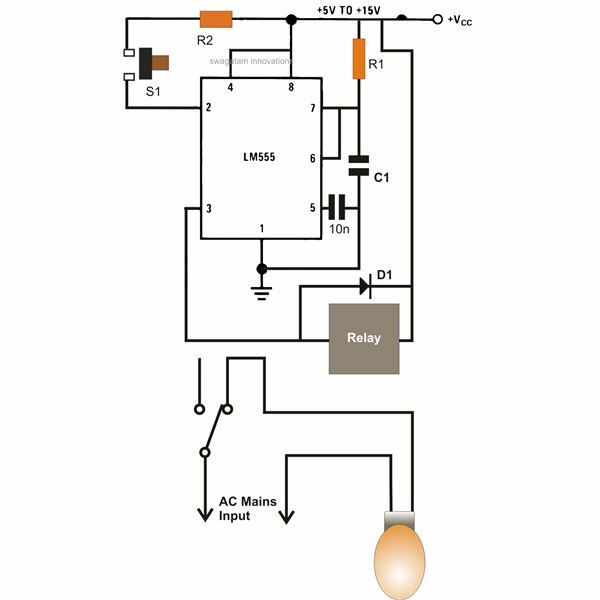 Any color of LED are often employed in the circuit depending upon its use.You can connect a switch with speaker to change off or start the alarm as per your wish as electronic circuits projects. Several homes have 2 doors for getting into. Therefore, every now and then it’s confusing for the resident to find out on which door is that the visitor present. These electronic circuits projects on doorbell circuit produces 2 totally different sounds are often used simultaneously on each the door. 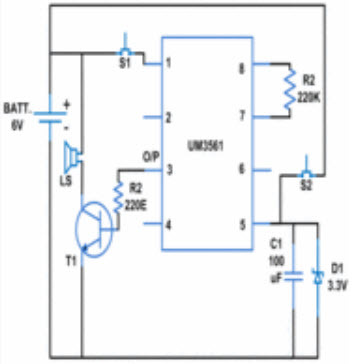 The electronic circuit diagram of UM3561 IC as the simple circuit project is as given in the figure as electronics mini projects with circuit diagram. When the switch S1 or S2 is pressed, the pin1 or pin5 of the IC1 receives the high signal that is employed to drive the transistor that’s connected to pin3 of IC1. Thus the speaker gets the availability and IC1 produces the sound of siren so on indicate the presence on the door. A transistor is employed in the process of amplification because the output of pin3 is very low. This can be implemented as electronic circuit’s projects. 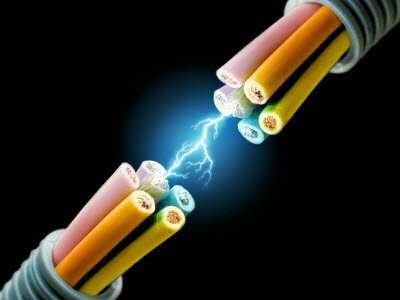 An AC power supply is needed for powering major appliances, however, most electronic circuits need a gradual DC supply. 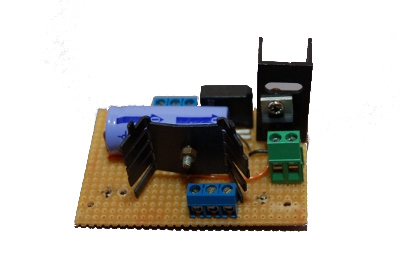 A straightforward rectifier circuit represented during this project converts the input from AC supply to DC voltage. Firstly, the AC input from the mains is stepped right down to a lower value of voltage. This AC supply is then felt a rectifier circuit to get rid of the negative cycle of the AC waveform. The ensuing signal is then filtered to get the DC output. The major part of the circuit is connected to the secondary coil of the transformer that is comprised of diodes and capacitor. Whereas the diodes act as rectifiers, capacitor filters out the DC element from the circuit. Electronics projects with circuit diagram free as given below. 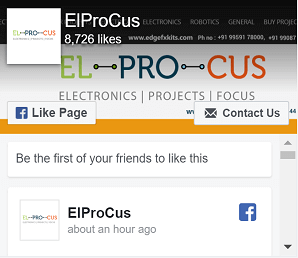 We provide it as electronics projects for engineering students with the circuit. In this simple circuit project, the input mains offer is stepped down from 230 V AC to a desired level (depending upon the rating of the load connected). The peak voltage across the load is matched to the peak value of AC voltage from The output of a transformer. This is achieved here by using a step down transformer 12-0-12V of 500mA rating. In an electronic circuit diagram of the above, the reduced voltage level (12V) seems on the secondary winding of the transformer. This AC signal has alternating positive and negative wave form cycle, whereas the specified output should be positive. Thus, the signal is corrected employing a bridge rectifier to block the negative portion of the waveform. CD4511 may be a CMOS BCD to seven segment latch, decoder and is used in varied applications like clocks, watches, computer, calculators, etc. One thing to be kept in mind with this circuit is IC 4511 is employed just for common cathode display. 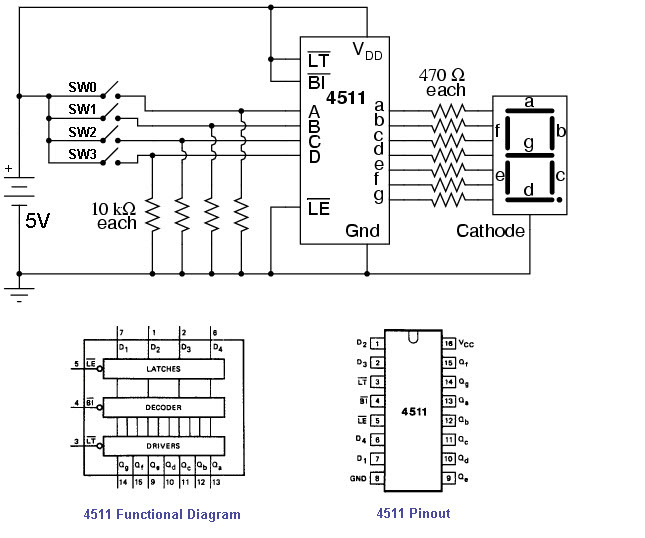 This IC provides the power of 4-bit storage latch, an 8421 BCD-to-seven segment decoder. 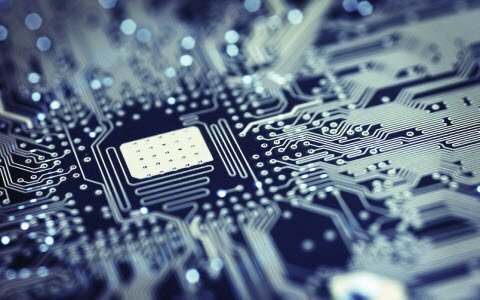 It conjointly provides you the power to examine that every one segments of seven segment display are operating properly or not (lamp test). For testing, momentarily build the pin low, in brief used to test the display. Blanking input is used to show off or vary the brightness of the display. The latch enable (LE) is employed to store BCD codes. In this BCD to seven segment display simple circuit project circuit, we offer binary input with the assistance of tactile switches. With the assistance of 4 switches we are able to give a four bit BCD (binary coded decimal) worth. This can energize the correct output lines according to switch pressed to create a corresponding numeric value on seven segment display. To understand the IC first have a glance at its pin configuration. Above electronic circuit diagram pins A, B, C, D are used to give the BCD input where A is that the least important bit and D is that the most important bit. 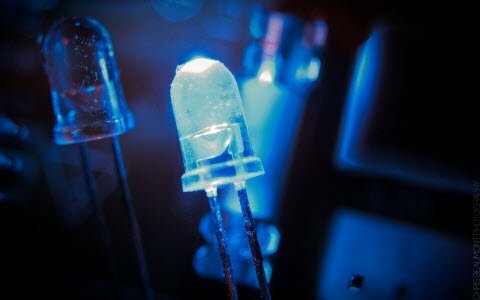 The pattern of LEDs is same as during a typical seven section show. Currently build the association as shown in the circuit diagram. Once you press Switch S1 (this time initial switch is at logic one else are at logic 0) then you may receive a numeric one on the show. As a result of with the assistance of switches you’ve got press the code 0001. Similarly for numeric two BCD code is 0010 means that you’ve got to press switch S2 and for three code is 0011 and then on. The table below can assist you the way to calculate the code for individual variations. Within the table shown below cross means that they’re stuck in do not care condition. This implies it’ll not have an effect on the output once logic zero or one is ironed. The LCD display of my circuit is blinking and is not working properly of a distance measuring using arduino circuit.Please help me out and reply soon. pls send me a circuit diagram (not block diagram)of iot garbage monitoring system? this site is of so much help. thank you very much. Thank you for your appreciation. It really helps us to work hard. Also, Please check the user friendly website http://www.efxkits.com for project ideas on all the latest technologies.